Potterville is a marvelous place to visit. It's full of wonderful lives and interesting, nice people, with enough evil around them to make for good drama. And now it's an even better place to visit on home video, thanks to brand new 4K releases from Warner Brothers. Potterville in this case isn't the renamed Bedford Falls of George Bailey's wonderful life "gift" from angel Clarence. No, this Potterville is a British place that kind of floats - via flying car or dragon, or broomstick - between Little Whinging and Hogwarts school of Witchcraft and Wizardry. I speak of Harry Potter, of course, the boy who lived through enough books and cinematic stories to choke a centaur. From "the Philosopher's/Sorcerer's Stone" to the second Deathly Hallows, millions of fans got to watch Harry, Ron and Hermione (and their assorted siblings, school mates, etc.) grow from cute little urchins to near adulthood, balancing the issues of growing up and entering puberty with the bigger picture issue of the timeless battle between good (Harry and his side of the equation) and evil (Voldemort and his). That universe was expanded recently thanks to J. K. Rowling's dipping her word processor back into the Potterville well with Fantastic Beasts and Where to Find them, which is also debuting on home. Warner Home Video released the Potter series on Blu-ray ages ago, in various incarnations including a cool "trunked set" and "ultimate editions" and they were good releases, too. But technology is marching on, so it's time for Warners to jump onto the 4K UHD (HDR) bandwagon, which they've now done by releasing four of the "Harryiest" titles from the series. Sold separately, the 4K discs are of the last four Potter movies, when the series had moved beyond the cuteness and sense of wonder of the first couple of films toward more darkness as the ultimate final battle approached between the Potterites and the Voldemortuaries. 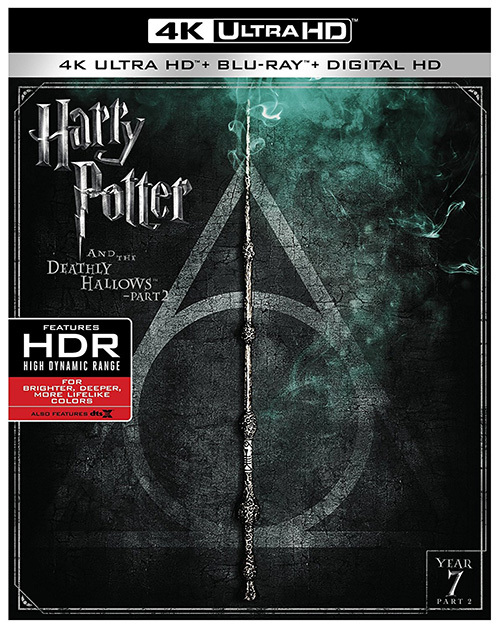 So we have HP and the Order of the Phoenix, HP and the Half-blood Prince, and the two HP and the Deathly Hallows finale films now available in nice new packages that not only ups the HD ante to 4K UHD (with HDR) but which also include in the box a regular Blu-ray (with extras) and a code for a digital download. If you haven't yet bought the Blu-rays for the series, this is a very good place to start, though it might have made more sense for Warners to start at the beginning rather than half way through the series. Who do they think they are anyway, George Lucas? The other four movies will be released in 4K later this year. Warner Home Video sent all four of the 4K discs (does that make them 16K? 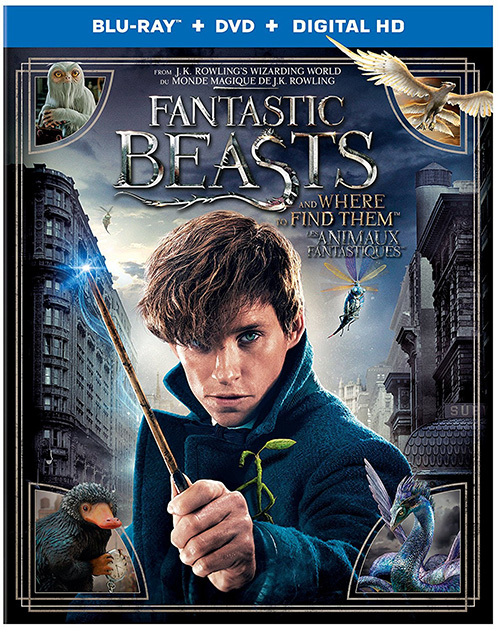 ), as well as a conventional Blu-ray of the brand new Fantastic Beasts and Where to Find Them. The latter film is available on 4K as well, but I guess the review copies weren't in yet. Fortunately, I could watch the Blu-ray in its native 1080p as well as up converted to 4K via Oppo's slick UDP-203 universal player. As regular readers of my rantings recall, 4K is the next generation of high definition TV and offers twice the vertical and horizontal pixel count (3840x2160 vs. 1920x1080) of conventional HDTV. The differences can be subtle, and nearly meaningless on smaller screens (just like 1080p doesn't really matter vs. 720p on smaller screens), but once the screen size goes up - and especially when HDR (High Dynamic Range) is added to the mix - the results can be really spectacular. UHD 4K is also undoubtedly the format of your next TV. The industry is changing over already, as you can see in your friendly neighbourhood A/V store or Costco, so it's worth taking seriously. And it can be a mostly painless transition that you can start right now because, at least with the 4K discs I've seen so far, studios also include a regular Blu-ray in the 4K disc package and that lets you "pay your video fix forward" even if you don't yet have the 4K TV and 4K disc player you'll need (watch the BD now and save the 4K disc for when you need it). It's a remarkable, and rather surprising, anti-planned obsolescence move from Hollywood. There's one other up conversion offered with 4K discs, too, and in these Warner Brothers instances it's the inclusion of DTS:X audio. It's the competitor to Dolby Atmos, and at this point I can't really comment on it because I (like the lion's share of people) haven't upgraded my home theatres to exploit all the extra channels. Fortunately, the new formats are backward compatible so you don't really miss out on the basic audio quality you know and love from your 5.1 (or 6.1 or 7.1) system playing lossless audio files. The downside of this, to the electronics makers at least, is that the backward compatibility means there's less incentive to upgrade your audio system - especially since Dolby TrueHD and DTS-HD Master Audio can already sound so great. Warner Brothers, in their press release, describes DTS:X as being able to "best fit the individual viewing space by seamlessly transporting sound to and through specific locations within the viewing environment - in front of, behind, above, and beside the audience." In 5.1, on my reference system, the sound on the movies was as I remembered it from the earlier releases: a wide and deep and broad sound field even without the DTS:X, with great dynamic range and fidelity, whether it be from chirping birds or thunderclaps that'll shake your home theatre just as it should. I have a theory that Warners chose the last four Potter films over the first ones because part way through the series - perhaps, to be cynical, when the studio realized they had a money tree on their hands - the production values, including the picture quality, went up, from being merely "great" to "spectacular." That really comes through on these four Potter programs. The image you get with all four films is definitely spectacular, so much so that I could notice a layer of grain on the films that hadn't been as pronounced on the conventional BD releases. The grain helps give a very film-like look, the 4K HDR treatment revealing fine details I'd never noticed with the earlier discs. Check out fabrics, and wall textures, and - well, just about everything in medium to close shots - it positively leaps off the screen. The longer and/or wider shots don't pop off the screen quite as much, but they still look wonderful! Bottom line for the picture is that these are definitely the best versions to own if you're a videophile and, as mentioned, even if you aren't a video snob like me they're still the logical versions to buy if you haven't purchased the conventional Blu-rays already and want them in your collection. Warners says the extras for each movie are the same as they were for the previous Blu-ray release but, as mentioned, thanks to the storage requirements of the 4K version you'll have to pull the Blu-ray out of the package to sample them. It's a pretty neat selection of extras, too, including a "making of" behind the scenes thing that's organized across the set by year and theme. For example, "Order of the Phoenix" includes Part 5 of "Creating the world of Harry Potter: Evolution," in which the series' four directors, accompanied by cast and crew members, "explore how the films maintained the increasing intensity of J. K. Rowling's literary series, from the expanding landscape of the wizarding world to the darkening palette of each successive film…"
Each disc has a feature like this, as well as others, though this series of documentaries would be enough as far as I'm concerned. It's fascinating stuff at times. Note: for these reviews, I used Panasonic's 4K TC-55CX850U 55 inch 4K TV coupled with Oppo Digital's UDP 203 player. J. K. Rowling's latest trip back to Potterville quite isn't up to the standards of the rest, but that doesn't mean it isn't well worth watching. Fantastic Beasts and Where to Find them is U.S.-set, and in the past - and it isn't really a Potter adventure as such. I guess you could say it's kind of analogous to how "Rogue One" fits into the Star Wars universe. Rowling wrote the script for this, unlike the other series for which she wrote the novels but none of the screenplays, and it's a prequel to the Potter stories (hey, maybe Warners really is channelling George Lucas!). It's a story of the wizard who wrote one of the textbooks the Hogwarts students will use in their studies later. And Rowling appears to have put the band back together, with director David Yates (who also drove all four of the abovementioned Potter 4K outings) and several of the other movers and/or shakers from that series back on board as well. And it shows; for the most part, the film feels very much like a Potter movie, except for the lack of the familiar characters. The book just happens to have the same title as this movie, and over the course of the two hours and a bit of this flick we get to see plenty of fantastic beasts and the attempts to not only find them, but to get them back under control before New York City is destroyed in a manner reminiscent of a Marvel or DC Comics movie. The havoc isn't just caused by rampaging creatures, though; there's a villain on hand, too, the evil wizard Grindewald, who is working with anti-wizard forces aligned against the magical folk, and thanks to that we get to see an incredible special effects battle and finale that's nearly as much of a CGI feast as in the final Harry Potter film or just about any other comic book adaptation these days. I enjoyed "Beasts" and it was nice revisiting this universe, and Warner Brothers has given the movie its due with this Blu-ray release. I wish they'd have sent the 4K disc version, which undoubtedly wasn't ready at the time, because the 1080p one is, er, a fantastic beast and so the 4K one is undoubtedly even more so. The 1080p picture quality is really top notch. I watched sections in native 1080p and then up converted to 4K via the Oppo player and, while I have to admit that I preferred the up converted version, the "garden variety" picture is still outstanding. Exteriors of NYC feature colours that are more muted than in the magical environs we get to see - but that makes those magical places even more beautiful to behold. The colours are rich, detail is the stuff of the best Blu-rays and the blacks are very deep and detailed. The best results, as with 4K discs, come during close ups, during which you can practically count the individual hairs on heads - and whatever the fantastic creatures have on their outsides. There's plenty of makeup effects as well, and under the high def lens they come off looking very realistic indeed. In all, it's a fine example of video quality the Blu-ray beast is capable of showing. Audio is offered Dolby Atmos and DTS-HD Master Audio 5.1, which are both lossless in nature. Obviously, I exploited the DTS version and wasn't disappointed. It surrounds you beautifully - you might be tempted to duck (another fantastic beast!) during the parts where the city is falling as the audio crashes all around you. Subtle sounds and the noises made by the various fantastic beast noises sound great as well. Dialogue is clear and crisp and James Newton Howard's score comes through both loudly (when it's loud) and clearly (all the time). Warner also piles on the extras, from deleted scenes to a 15 or so minute "Before Harry Potter: A new era of magic begins," in which the four main stars, writer Rowling, director Yates and others talk about how the new story gestated. "Characters" is nearly a half hour long and includes five segments in which the gang and the costume designers opine. "Creatures" is nearly as long, and obviously focuses on the more fantastic stuff of the title. The longest feature, "Designs," showcases the great overall look of the film (in six segments). It's interesting stuff. Fantastic Beasts and Where to Find Them is a worthy entry into the Harry Potter canon and Warners' Blu-ray release is an excellent example of the species. The package also includes a DVD and digital copy, for extra viewing flexibility. I'd probably choose the 4K version, since it also comes with a Blu-ray (and download code, though no DVD) and will therefore let you enjoy the film as much as possible until you make the inevitable move to 4K when you replace your current equipment.